If your opponent controls a Level 5 or higher monster, you can Special Summon this card (from your hand). A Synchro Summon using this card as a Material cannot be negated. If a player Synchro Summons ..
During your opponent's turn: You can banish this card from your Graveyard (this is a Quick Effect); excavate the top card of your Deck, and if it is a Normal Trap Card, Set it to your side of the fiel..
You can banish this card from the Graveyard; Special Summon 1 Plant-Type monster from your hand, and if you do, it is unaffected by your opponent's Trap effects this turn. You can only use this effect.. When this card destroys an opponent's monster by battle and sends it to the Graveyard: You can Tribute this card; Special Summon 1 Plant-Type monster from your hand or Deck in Defense Position. You ca.. If your opponent controls a monster, and you control no other monsters: You can target 1 Fusion Monster in your Graveyard; banish both this card from the field and that target, and if you do, Special .. If you control a "Blackwing" monster other than "Blackwing - Kris the Crack of Dawn", you can Special Summon this card (from your hand). You can only Special Summon "Blackwing - Kris the Crack of Dawn.. 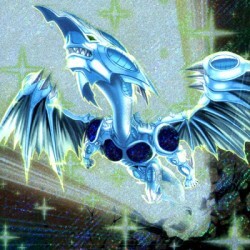 Cannot be used as a Synchro Material, except for the Synchro Summon of a "Blackwing" Synchro Monster. During the End Phase, if this card is in the Graveyard because it was sent there from the field th.. When this card is Normal Summoned: You can target 1 Zombie-Type monster with 0 DEF in your Graveyard; add it to your hand. If you control a Zombie-Type monster (other than this card), this card gains .. If you control a "Tristan, Knight of the Underworld", you can Special Summon this card (from your hand). Cannot be Special Summoned by other ways. You can target up to 2 Zombie-Type monsters you contr..
Must be Special Summoned with "Mask Change" and cannot be Special Summoned by other ways. This card can attack your opponent directly, but when it does so using this effect, the battle damage inflicte..
1 "Blackwing" Tuner + 1 or more "Blackwing" non-Tuner monsters. You can target 1 Level 5 or higher Winged Beast-Type monster in your Graveyard; Special Summon it. During either player's turn, when you..
1 Tuner + 1 or more non-Tuner monsters. If this card is Special Summoned: Inflict 800 damage to your opponent, then 1 face-up monster your opponent controls loses 800 ATK and DEF. You can only use thi..
1 DARK Tuner + 1 Dragon-Type non-Tuner monster. Cannot be destroyed by battle. When this card destroys an opponent's monster by battle and sends it to the Graveyard: You can activate this effect; this..
3 Level 9 monsters. You can also Xyz Summon this card by using a "Galaxy-Eyes" Xyz Monster you control as the Xyz Material. (Xyz Materials attached to that monster also become Xyz Materials on this ca..
2 Level 2 monsters. While this card has an Xyz Material attached that was originally WATER, it cannot be destroyed by battle. Once per turn, during either player's turn: You can detach 1 Xyz Material ..
2 Level 5 monsters. Your opponent takes any effect damage you would have taken from their card effects, instead. When this card destroys an opponent's monster by battle and sends it to the Graveyard: ..
2 Level 6 monsters. You can also Xyz Summon this card by detaching 1 Xyz Material from a Rank 5 Xyz Monster you control, then using that Xyz Monster as the Xyz Material. (Xyz Materials attached to tha.. When an opponent's Special Summoned monster declares a direct attack, if its ATK is greater than or equal to your LP: Negate the attack, and if you do, draw 1 card, then you can Special Summon 1 "Star..
You can Special Summon this card (from your hand) to your opponent's side of the field in Defense Position, by Tributing 1 monster they control. If Summoned this way, during the End Phase of this turn.. If you have "Right Leg of the Forbidden One", "Left Leg of the Forbidden One", "Right Arm of the Forbidden One" and "Left Arm of the Forbidden One" in addition to this card in your hand, you win the ..
During your Standby Phase, if this card is in your Graveyard: You can add it to your hand, also banish 1 "Sinister Serpent" from your Graveyard during your opponent's next End Phase. You can only use ..